Are you more progressive or conservative? Turns out it makes a difference in your love life. OkCupid recently found that among its members, ACLU supporters, who are generally associated with more progressive political views, get more dates. Talking politics on a date has historically been tricky, especially now with the U.S. so divided. Because politics is front and center in our lives today, online daters like to know where allegiances lie before they decide whether to like or pass on a person. Political beliefs do matter when it comes to dating, which is why OkCupid came up with a way for users to identify someone’s politics up front, offering badges to show what causes the user supports, like the ACLU. People can also choose to keep their politics out of their love lives, of course. But according to OkCupid, this won’t win you as many dates. Per OkCupid’s research, 90 percent of its users support the ACLU and their #RighttoLove campaign, which supports the LGBTQ community. 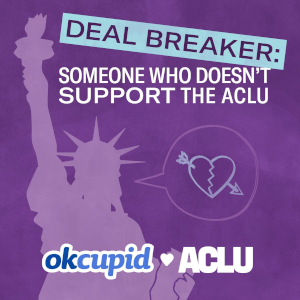 OkCupid offered the ACLU badge in June in celebration of Pride month. "100 percent you are more likely to go on a date with the ACLU badge," OkCupid’s Chief Marketing Officer Melissa Hobley told news website The Hill. She also pointed out that discussing politics over the app had become more routine in the current political climate. "What helps inform our decisions on our partnerships, like the ACLU badge, is what we see our users talking about." OkCupid has a history of being on the progressive side of culture. (Though the company is quick to point out that there are a number of conservative users, too.) It was the first dating app to offer more inclusive labels for profiles with 22 gender and 12 orientation options. And from the beginning, the platform offered questions to help users get to know one another beyond what is listed in a profile, sparking wide-ranging conversations among users, some of them political. The dating app also offered to donate one dollar for every OkCupid user with an ACLU badge, up to $50,000. As of July 31 this goal was reached. For more information on this dating service you care read our review of the OkCupid app. What a load of crap. The bottom line is most women (and smart men) detest Trump and all those that support him. He is simply the perfect example of what is wrong with this type of thinking. It has nothing to do with supporting the ACLU. That is simply a by product. All these dating sites sucking up to women has created a problem as it has unbalanced things to a point where women have become everything they claim to despise...players, serial daters, or both.